The C Bar is a cozy Bar in Pai’s Nightlife scene with sofa’s, cool drinks and a fancy design direct in the heart of Pai, the pearl of Mae Hongson. Well shake Cocktails, Beers and many other beverages you can order at C Bar. The friendly and open minded staff and the electronic chill out music promise a nice evening with self minded people from around the world. From here you have a great view to the night market in Pai village in Thailand. Many people come to the C Bar after a shopping adventure on the market to meet nice people and speak about travel experience or day trips in Thailand’s Maehongorn province. 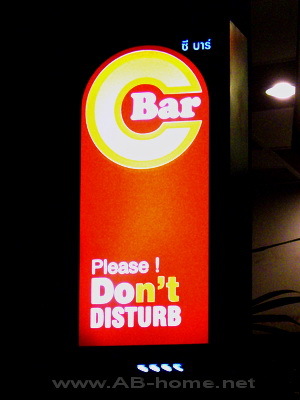 C Bar in Pai is a great location for chilled Nightlife in Pai, Thailand. Great Nightlife location in Pai! The Lun Laa Bar in Pai, Thailand offer Cocktails and other local and international beverages in an exalted but cozy atmosphere. 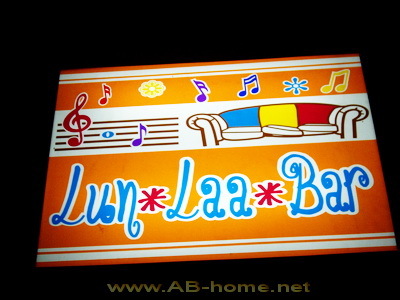 Lun Laa Bar is very popular by backpackers, traveler and locals. Couches, chilled light and the nice courtyard promise a great evening with nice and nice people who easy attempt friendship. This Bar in central Pai is easy to arrive by walk from any GH in town. The Lunlaa Bar is one of Mae Hongson’s coziest locations for Cocktails. Here you can spend an unforgettable evening with other backpackers which are on the way through Thailand to chare stories and experiences. LunLaa is a “must go” Bar for traveler who are looking for quiet nightlife in Pai. The amiable people here at Mellow Yellow Pub in Pai make this nightlife location in Thailand’s Mae Hongsorn province to a highlight on your backpack tour through Asia. This is the right location for nightlife in Pai for all open minded travelers who want to relax by a cold beer in a canny atmosphere. At Mellow Yellow in Pai you have the chance to share travel stories and adventures with other backpackers while you lie down in a hang mock. 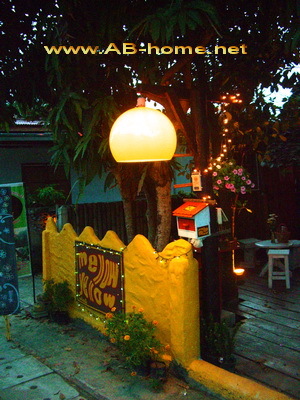 The atmosphere is casual and the nights can be long here at Mellow Yellow in the center of Pai. This Bar serves good Cocktails, Beers, Soft drinks and good local and western food and is a good possibility to meet like minded people from many places here in Pai village in north Thailand. 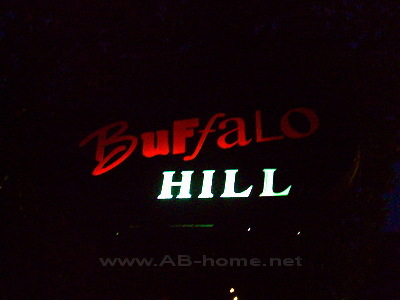 The Buffalo Hill Pub in Pai is a nightlife location for traveler and backpacker who like draught beer and live music. The small corner Bar is direct opposite the high school of Pai in north Thailand. Many visitors assemble here at Buffalo Hill every evening to share travel experiences from day trips and adventures in Thailands Maehongsorn province or elsewhere in SE Asia. This nightlife location in Pai in Thailand serves Cocktails, Longdrings, Spirits and some local Draught Beers till late in night. The service is very advertent and the drinks come in a good quality and temperature to your wooden table. At Buffalo Hill in Pai in Mae Hongson is a great and relaxed atmosphere for open minded traveler from around the world. New Travel Reports you can find here. Pai Now offer fresh and delicious coffee of the Black Canyon brand in Pai. 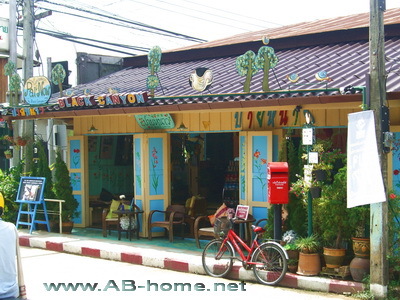 You will recognize the colorful Cafe on the corner of the main road near the Hospital in Pai, Thailand. Pai Now/Black Canyon serves all kind of Coffee specialties with a friendly service in the heart of this village in Thailand’s Maehongsorn province. This is a nice location to relax by a good cup of Espresso after a shopping turn in Pai or an adventure trip somewhere in northern Thailand. My absolute favorite at Pai Now is the iced Cappuccino. Because of the reasonable prices come here many traveler from many places of the world together, enjoy a delicious cup Tea and chare travel experiences from her tour through South East Asia. If you are looking for a fresh Coffee in the center of Pai, than you are right at Sincere Coffee here in northern Thailand. Near the first 7-11, direct in the heart of Pai in the Maehongson province of Thailand is the cozy coffee shop Sincere. Here you get delicious coffee specialties like Espresso, Cappuccino, Americano… with your choice of hot or iced. 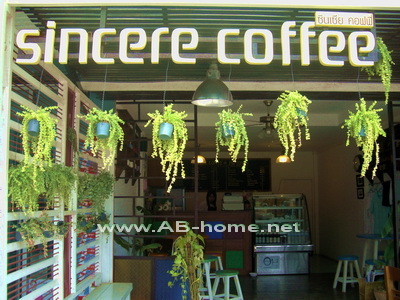 Sincere Coffee in central Pai is a great meeting point for backpackers on their travel tour through South East Asia who don’t want to miss a delicious cup of Tea or fresh coffee. 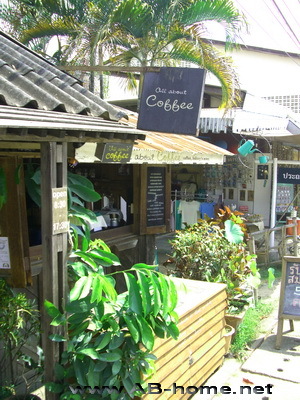 All about Coffee in Pai village offer great coffee specialties in the center of this cozy town in northern Thailand. The small art Café open every day from 8 am to 7:30 pm. 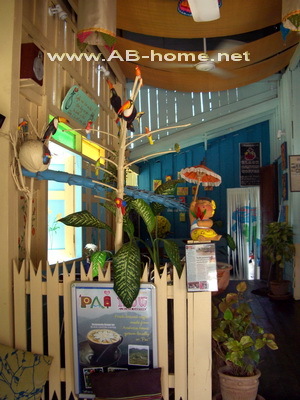 Here at All about Coffee in Pai you have the choice of many types of selected beans imported from around the world. It’s a nice meeting point for backpacker and tourists in central Pai in northern Thailand’s Mae Hongsorn province. We like to come here for a delicious Cappuccino, Americano or a fresh fruit shake. The prices are reasonable and the quality of the beverages is perfect here at All about Coffee in Thailands Maehongson province in SE Asia. 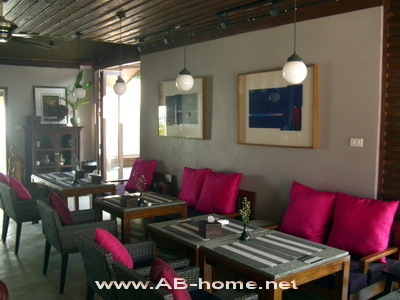 The beautiful Lilu Hotel in the center of Pai offer stylish rooms with international standard for reasonable prices. The price in October 2009 was 1000 Thai Baht for a standard room and 1600 THB for a mini suit direct on the river of Pai in northern Thailand. All rooms have hot water, air-condition and a mini bar. The prices are including western breakfast and Hotel Room Service. The Lilu Hotel is in walking distance to the bus station and any location in Pai town in Thailand’s Mae Hongson province. Many tourists and backpacker come here to explore Pai and the environment in the Mae hongson province. The prices are good for a boutique Hotel here in this part of Thailand. Lilu Hotel is a good accommodation choice for traveler who don’t want to miss the comfort of western Accommodations here in this beautiful part of Asia. The Nam Tok Mor Paeng is about 8 km out of Pai city in Thailand’s Maehongson province. On the way to this peaceful place you will pass Thale Mhog Bungalows and the Chinese village next to Pai. This waterfall is free, but take some money if you want to stop somewhere at one of the restaurants to buy some cool drinks or have lunch. The Mor Paeng waterfall is about 15 meter high and is for me one of Pai’s main attractions. Here you will find a lonely place to read a book, relax or just listen to to sound of nature. 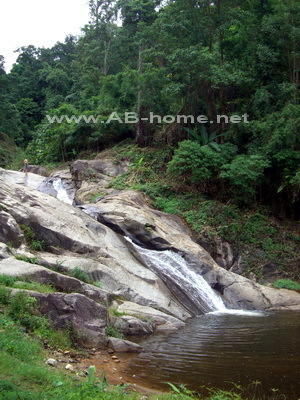 The surrounding landscapes are dominated by mountains and high and old trees which spend you shadow from the Asian sun. In front of this waterfall in Mae Hongson province in north Thailand is a jungle pool witch invite the visitors to swim, so toke your swimming gear if you want to refresh under the fresh water of the Nam Tok Mo Paeng. The best way to come here is by bike or motorbike. Have fun and enjoy this great travel destination in north Thailand! For new Reports click here. The nice hostel accommodation Baan Thai Village is just a few minutes’ walk from the bus station in the center of Pai in north Thailand. 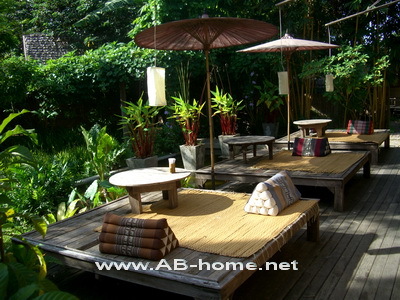 Here at this guest house in the Mae Hong Son province you have the option for bungalows from 350 to 850 Thai Baht. We had a small bungalow in July 2009 with an own bathroom for 350. The rooms for 850 Baht are a bit bigger. 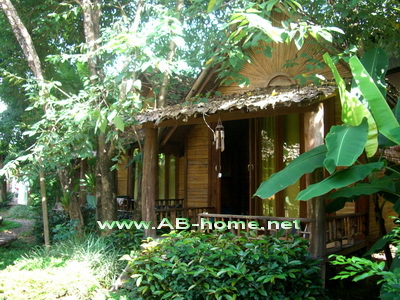 All bungalows here at Baan Pai village are made of bamboo wood and have a leaf roof. The way to the cozy hut goes through a beautiful garden with a small water stream and bamboo bridges. In the restaurant of Baan Pai Village they serve good food and cool beverages to cool down of the hot temperatures from the Asian sun. 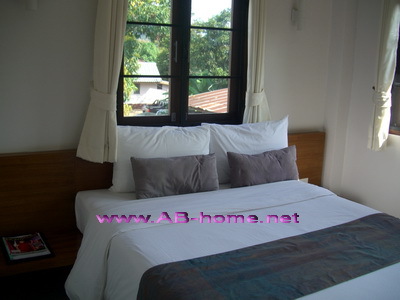 This guest house is a nice option for all travelers in north Thailand who want to stay direct at town of Pai. We enjoyed our stay here at this accommodation not at least of the friendly service at the reception.